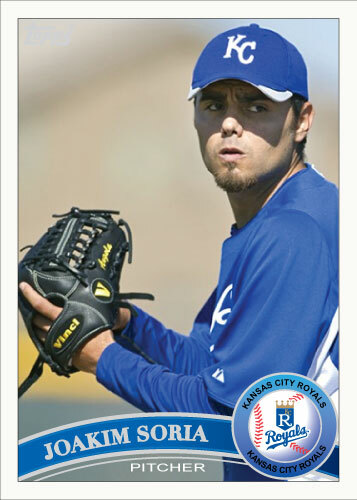 Joakim Soria is the part of the Royals that strikes fear in opponents. If a team is trailing the Royals in the 9th they know they have a tough road ahead. I’m not trying to be over the top and say “GAME OVER” needs to be on the scoreboard or anything but Joakim Soria is as consistent of a closer as there is in the game right now. The Royals need Soria for so many reasons. Before Mr. Soria arrived via the Rule 5 draft, the Royals had a lot of trouble closing out games. Now we just have to worry about the setup man, middle relief and starting pitching. Soria has the perfect demeanor for a closer as well. He comes in the attitude and intimidation factor that I believe is a very real quality you need in a closer. Nick Scott from brokenbatsingle tweeted a good little Soria stat a couple days ago; “ERA from 2007-2010 : Soria 2.01 Rivera 2.05” That gives you a great window into just how good Soria has been for the Royals. He may very well be the best relief pitcher in baseball right now. Another reason the Royals need Soria so badly is his consistency. Consistence is something the Royals are lacking, really everywhere as of last year. For Soria, this especially applies to the bullpen and starting rotation. The pitching shows glimpses of being good but will have an occasional blowup that us Royals fans are so used to seeing at this point. People talk about the future coming to KC but Billy Butler and Joakim Soria and possibly even Luke Hochevar and Alex Gordon are still so young that there is no reason they can’t be cornerstones in movement of great talent coming to Kauffman Stadium. This is the last of my spring training 2011 Topps set. I think it went really well. A couple holes never got filled that I would have liked to have seen in the set(Opening Day catcher for instance.) I was hoping to break 50 cards; I didn’t but did finish with a very strong 47 card set. 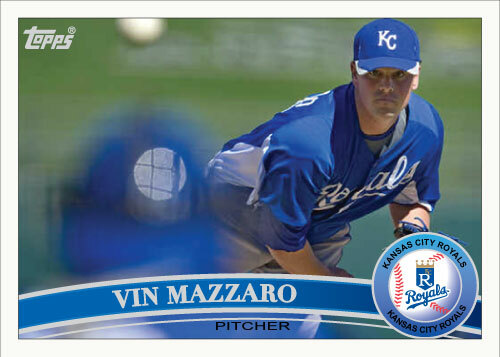 Many card of players that might never have a proper Royals card. I like the set for the fact that I was able to include the likes of Danny Duffy, Eric Hosmer, Wil Myers, Mike Montgomery and Mike Moustakas. 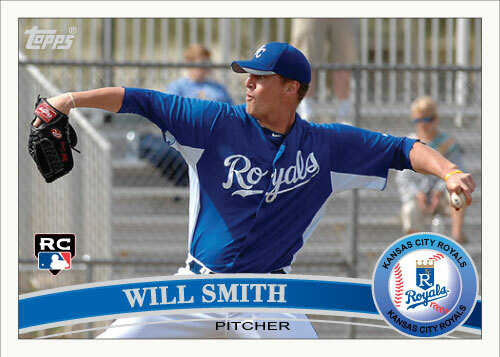 These players will likely have Topps cards in the next couple years but I consider this a sneak preview. Now that spring training is over I can wrap up the set and figure out what to do next. This is a cleaning of the closet of sorts for my spring training Royals set. I had four cards left to post counting these three entering the day. These were the “extras.” Not to say they are especially bad, I just never fit them in. First there is Will Smith. He entered camp as a left handed relief pitcher and was an early pick by me to make the club. Unfortunately he never performed well enough to even get an extended look. He was sent to minor league camp before minor league camp even began I believe. 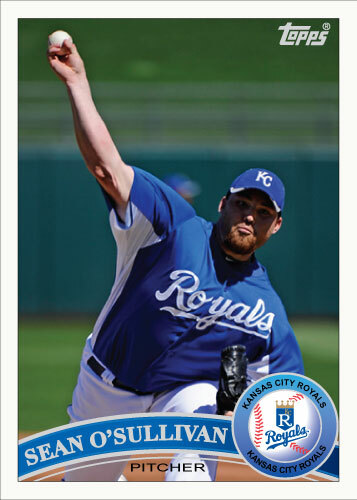 He is another good left handed arm in the Royals system that we could see in the bullpen in the future. Pedro Feliz was a bit of a mystery to me. In past years a player of Feliz’s caliber would have had a shot at the team but this year was a real long shot. He is a veteran player past his prime. He has some power but didn’t really fit with what the Royals are going for this year. He would have been a player much more along the lines of Melky Cabrera or Jeff Francoeur because he is experience but his stock is currently low. Also third base had some really respective candidates in Royals camp. Mike Aviles won the job, behind him, utilityman Wilson Betemit is best at third and entering camp there was an outside shot that Mike Moustakas could make the club. Overall, Feliz just didn’t perform well enough to force anybody off the roster and was released at the end of spring. 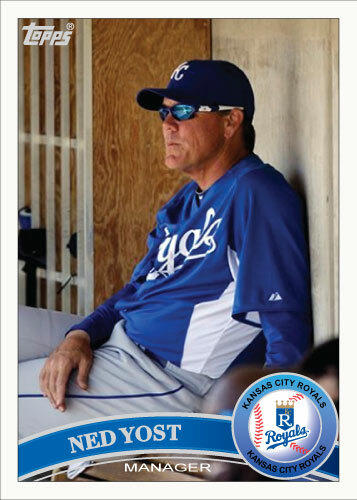 Ned Yost enters his first full year as Royals skipper in 2011. I like him with the young club and think he will do a respectable job but will have a lot of losses ahead of him before he can return Kansas City to the playoffs. What I want to talk about however are cards of managers. I always despise getting them in a pack and if I were ever to make a full card set, it would not include manager cards. I put Yost in my spring training set simply because it was convenient. I mentioned I had four cards left, this is three so one more will be in my next post. I will just say that he will always be the Mexicutioner to me. Mitch Maier had a roster spot when he came to camp. Maier did nothing to show this was undeserving however. He had a monster spring and if it was an open competition in right field would have taken the spot for Jeff Francoeur easily. 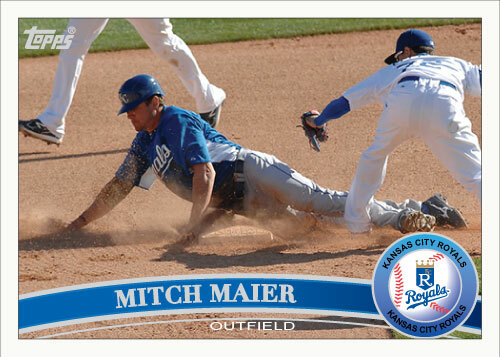 Mitch Maier is my last position player card that made the opening day roster other than Matt Treanor who I have yet to see in a Royals uniform. I would rather see Lucas May catching for the Royals than the more experienced Treanor. The Royals broke camp today with a 3-2 win over a hated division rival, the Chicago White Sox. They finished with a 20-10 record and won the Cactus League crown. All this really means almost nothing. Here is what is important today, the Royals selected their 25 man roster. Here it is as the great Bob Dutton put it in a Kansas City Star article. •	Pitchers (12): The four-man rotation consists of Luke Hochevar, Jeff Francis, Kyle Davies and Bruce Chen. All-Star closer Joakim Soria heads an eight-man bullpen of Robinson Tejeda, Kanekoa Texeira, Sean O’Sullivan, Collins, Jeffress, Crow and Adcock. Francis, Chen and Collins are left-handers. •	Catchers (2): Treanor and Brayan Peña. • Infielders (6): The first base/designated hitter tandem of Billy Butler and Kila Ka’aihue, second baseman Chris Getz, shortstop Alcides Escobar, third baseman Mike Aviles and utilityman Wilson Betemit. So I am finishing up my spring training card set in the next two or three days. Today I finish up the pitchers that made the roster. Mazzaro didn’t make the roster on opening day but he did make the team. They just don’t need him yet so he will stay in Arizona for a while longer. Mazzaro is the team’s fifth starting pitcher. He got it because of the stock the team has in him, not by his performance this spring. Sean O’Sullivan out performed him. The team traded David DeJesus for him so they really need to see what the guy can do. O’Sullivan will work out of the bullpen in long relief to start the season which is a good role for him to be in. I had heard a ton about Wil Myers and how good he was before I saw him. I think when you hear so much about these prospects you tend to get an image in your head of a Major League ballplayer. 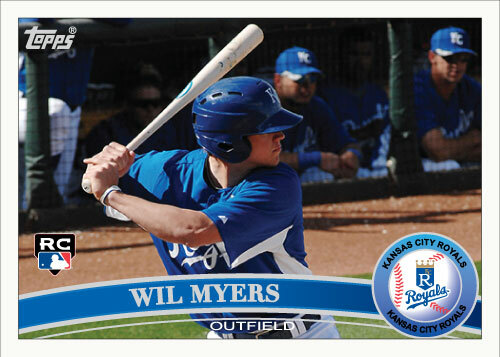 I was shocked when I saw Wil Myers dig in for a spring training game this year. He was just so…young. He looked like he would fit in at a local high school baseball game, not be a name on the lips of the front office of a major league team. Myers has done nothing so far to suggest that he isn’t deserving of the praise he is getting. He has been learning the toughest position to play for years now as a catcher but that weight has been lifted off his shoulders. He is an outfielder now for nearly the sole purpose of getting him to Kansas City sooner. I sometimes get in a hurry to want to see these prospects in KC but seeing a guy this young makes me realize that there is plenty of good playing years ahead and that it is essential to not rush these guys into competition they are not ready for. 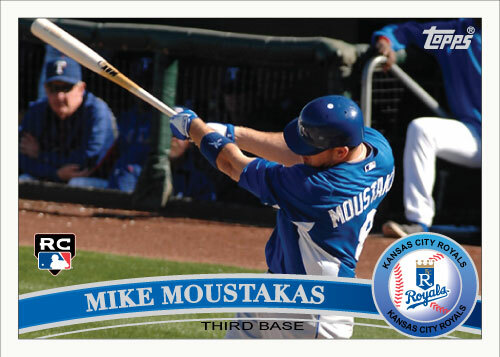 The general consensus is that Mike Moustakas will be playing in Kansas City in June. That is exciting, the prospects are getting really close now. Even Eric Hosmer could be getting some playing time in Kansas City but I actually think he won’t. My prediction is that Kila Ka’aihue will have a very good season. Once this becomes apparent to the Royals, Hosmer will become an outfielder. Moustakas of course doesn’t have any roadblocks like Hosmer does. Third base is being “held” for him until he is ready. I know that this is really stretching at this point but it is hard not to think of the potential lineup that the Royals could have in as little as two years. So here is a rough outline, and it isn’t even putting Alex Gordon in the mix who hasn’t had a ton of big league success but is still very young and has time to turn it around. 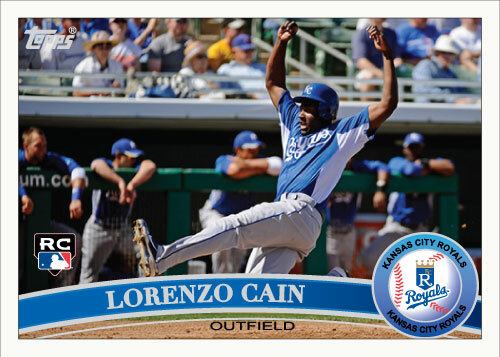 I have high hopes for Lorenzo Cain. He obviously came over in the Greinke deal and looks like he may be ready to be a full time big leaguer. The problem is that the Royals signed Melky Cabrera before the Greinke deal went down. This means Cain is not going to be on the Royals roster because of a crowded outfield situation in Kansas City. The starting outfield appears to be cemented; Gordon-Cabrera-Francoeur. Mitch Maier has played so well this spring that he is certain to be on the roster since he is out of options. That potentially leaves one outfield spot left for Gregor Blanco, Lorenzo Cain and Jarrod Dyson. Who will win? 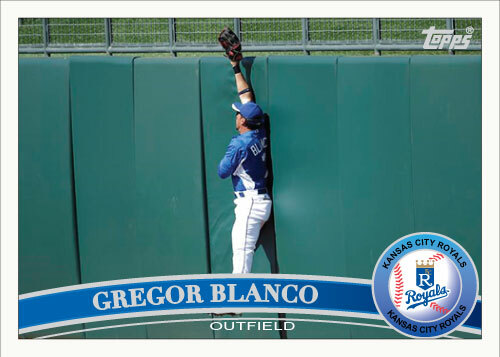 Likely Gregor Blanco. I would rather see Cain or Dyson however. Cain should be a part of the future in Kansas City, Dyson is very likely to be part of the future. So why Blanco? One Word: Options. Blanco is out of them which means if he doesn’t make the team the Royals are almost releasing him. I think Blanco is a good slot filler for right now. He is a good backup center fielder for a big league club. But why have a backup playing when Cain and Dyson appear to be able to hold down the spot as well? Dyson is so fast that he would be a huge asset on any big league club. Example: Felix Hernandez is a great pitcher. He can shut an offense down for a day and almost single-handedly win a game. This spring Felix Hernandez pitched against the Royals, he didn’t have his best stuff and the Royals beat him up much more than they will in the next few months. But I want to focus on Dyson and what he did in that game. Dyson is not great offensively but he went 3-3 against King Felix that day. How? 3 infield singles. Yeah, you read that right, 3 consecutive infield singles. If Felix was on that day, those could have been huge in making progress against a very dominating pitcher. 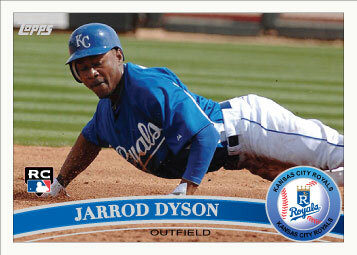 Especially with Dyson’s speed and ability to steal bases. If my memory serves me correctly, I think he stole second on two of those three times on base that day. The bottom line is that Dyson and Cain have options and Blanco doesn’t. That means Dyson and Cain will only be in Kansas City on April 2nd when the Omaha Storm Chasers take on the Northwest Arkansas Naturals. That is until Cabrera or Blanco get hurt or get traded. I hope the Royals find a way to get Dyson and Cain in Kansas City soon. Editor’s note: Dyson’s card to the left had already been posted but I talked more about him today than I did on the original post so I found it appropriate to re-post it today.